I really wanted to like the Garmin VIRB 360, in fact I was very excited when it was first announced. I thought, judging from the specs, that the VIRB could be the best consumer 360 camera ever. 5.7K 360 video, water proof, augmented reality overlay, half a dozen sensors, it seemed to have it all. What I’ve since discovered is that the Garmin VIRB 360 has the potential to become the best 360 camera out right now, but it hasn’t quite hit the mark. Deeply flawed software means the VIRB is at best frustrating and sometimes unusable. There is such a thing as too many features and I think Garmin have attempted to but everything but the kitchen sink into this camera without making sure it actually works properly. There are a lot of good things to say about this camera, but these are undermined by some huge issues. Details below. Great hardware is let down by incomplete software. Still takes amazing 360 video, but photos are less impressive. Water resistance and 6 sensors make this an ideal action cam. When you open your VIRB 360 you’ll find a neatly packed camera with a tripod and two accessory adaptors. One of these adaptors makes your VIRB compatible with GoPro accessories and the other has a standard tripod mount. A micro USB charging cable and instruction book completes this ensemble. The tripod is a welcome free accessory which is actually very solid and can act as a handle for the camera. Apart from this there isn’t anything too exiting in the box, apart from your new $800 camera of course. Let’s get onto that. The camera itself is a sort of cube shape and it can sit independently on a flat surface without moving. On top of the camera you’ll find a basic LDC screen and three buttons which allows for manual control. One of these buttons is also the power button. I’ve found you need to press pretty hard on these buttons to get them to respond, perhaps a part of the waterproofing process. On one side you’ll see a sliding button with a red line, this is the manual recording button which allows you to start recording without connecting to the app. The opposite side of the camera features a door which clocks open to reveal the microSD port, the charging port and HDMI port. The camera appears rugged and feels sturdy. The material is plastic but not the cheap kind, it certainly feels heavier than it looks. You can easily hold it in one hand, but it’s slightly bigger than a GoPro. All in all the VIRB 360 looks and feels like an action cam. 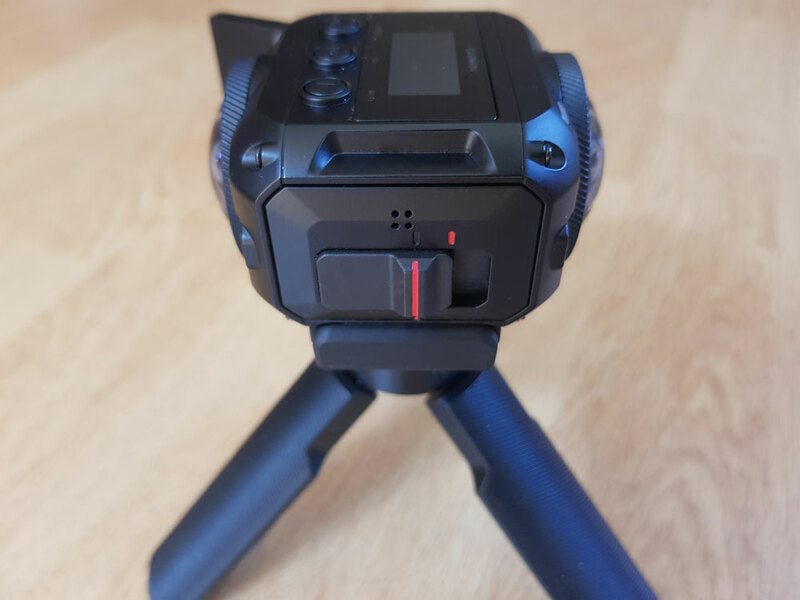 The VIRB can shoot 360 sound, which means it can record sound from every direction using 4 separate microphones which are visible on the cameras casing. An impressive feat to be able to waterproof this camera with so many mics! One of the most impressive things about the VIRB 360 is the number of sensors packed into the tiny frame, that’s if you ever get to use them properly. You’ll see a list of sensors on the menu which you can activate and deactivate, they include; Barometric Altimeter, Accelerometer, Gyroscope, Compass and GPS. All of these sensors provide the VIRB with a shed-load of information about its surroundings which it can use to create the data overlays Garmin is famous for. Unfortunately due to my less than great experience with filming using the VIRB 360, I was not able to fully utilise all of these features. I’ll get to the reasons why below. I must say that when the video function is working, the combination of all of these sensors means you can create amazing data overlays on your videos, known as G-Metrix. The front and rear only lenses are pretty pointless, this is a 360 camera and that’s what you’ll be using it for. You are most likely to use the 360° at 4K mode as this is the easiest and doesn’t require manual stitching. You might be asking, why not use the 5.7K mode? Well, you can, but you better have some experience of stitching 360 video manually. 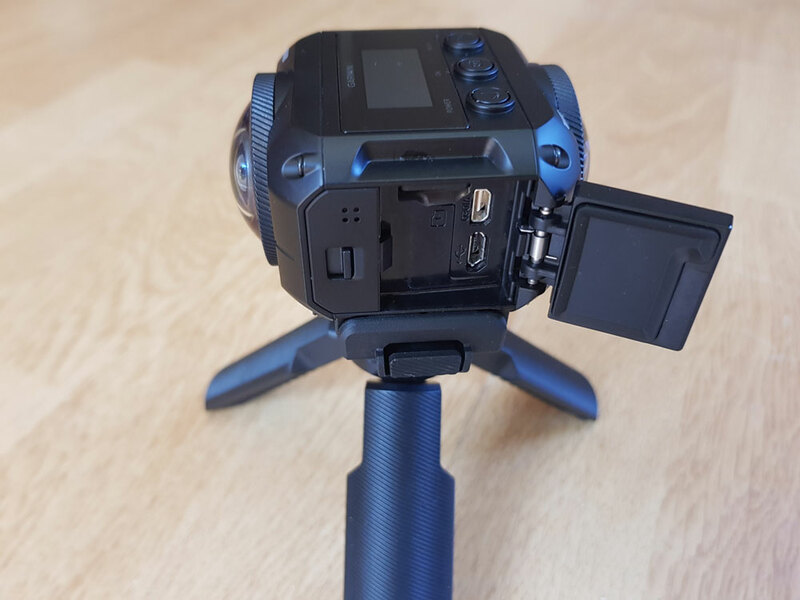 A headline feature of the Garmin VIRB 360 was its ability to shoot 5.7K 360 video; this was a very exciting feature to me and meant the VIRB stood out from the many other cheaper 360 cameras that could only shoot 4K of below. I took note of the fact that 5.7K video would not feature automatic stitching, but I assumed Garmin had a plan to allow us to stitch this video manually with ease, not so. When you shoot in 5.7K you are left with two separate video files (which will be huge if shooting for more than 30 seconds), which you must stitch together manual using a separate program. Garmin offers no advice on which program to use or how to do this, which I think is a huge oversight. Samsung provides a program which stitches video on the desktop, because their Gear 360 camera cannot stitch 360 video automatically, which is an acceptable compromise. Simply leaving your customer with no easy way to create the best quality video shows a lack of care that’s hard to forgive. Fortunately I had some experience of manually stitching video so I was able to use this feature, however I imagine many do not and probably don’t realise that there is no support from Garmin in this regard. Update: Garmin released a software update that allows you to stitch 5.7K video automatically, so this problem is now solved! Shooting in 4K 360 mode produces started 360 format videos which you don’t have to touch before uploading (unless you want to apply graphics or stabilization), so for most people this is going to be a 4K 360 camera. Thankfully the quality of the 4K video is actually really impressive, certainly the best 4K 360 video I’ve seen from any consumer 360 camera. You’ll see in my example videos below, but the video from the VIRB 360 is clear, sharp and the colors not washed out of over saturated. The stitching lines are nearly invisible unless you get close to the camera and the frame rate is a smooth 30fps. You can also shoot in time-lapse mode (either 5K or 4K) at different intervals. I really like 360 time lapses so it’s great to have more options in this regard and the camera does a great job of creating them. Here is a mix of time lapse and normal speed 4K 360 footage from the VIRB 360. This was shot in optimal lighting conditions using the tripod that came with the camera. The time lapse looks decent, if a bit too fast. I set the interval at 2 seconds, but I think 5 produces a better time lapse effect. The normal speed video is clear and the colors are true to reality. This is a flat, non 360 video comparison between the Garmin VIRB and the 2017 Samsung Gear 360. The videos were shot at the same location one after the other and both videos were shot in the 4K mode of each camera. As you can see there is quite a difference between the two and in my opinion the Garmin footage is the better. The clarity of the image is greater and thee colors are not over saturated like the Gear 360. You can also compare the difference in sound quality; the 4 mics in the VIRB really giving it the edge. 360 cameras do not tend to do well in low light situations, so I wasn’t expecting anything amazing from the VIRB 360 when I took it to a concert at 1am. This first half of this video was shot quite far from any light source in pitch black, and the camera clearly struggled. The second half is much closer to the stage and the camera performs much better, with the audio in particular coming out much better than I thought it would. This 15 second video came to over 2GB in size, so any long video shot in 5.7K is going to be huuuuuge. The quality of the video at 5K is noticeably better and it’s probably worth always shooting at this resolution. All of these videos were shot with the default video settings on the “vivid” profile. The 360 video shot with the VIRB is a step above any other 360 camera I’ve used. Even at 4K resolution the image appears clearer, sharper with more accurate colors. The 5.7K video option is by far and away the best 360 video I’ve ever shot. 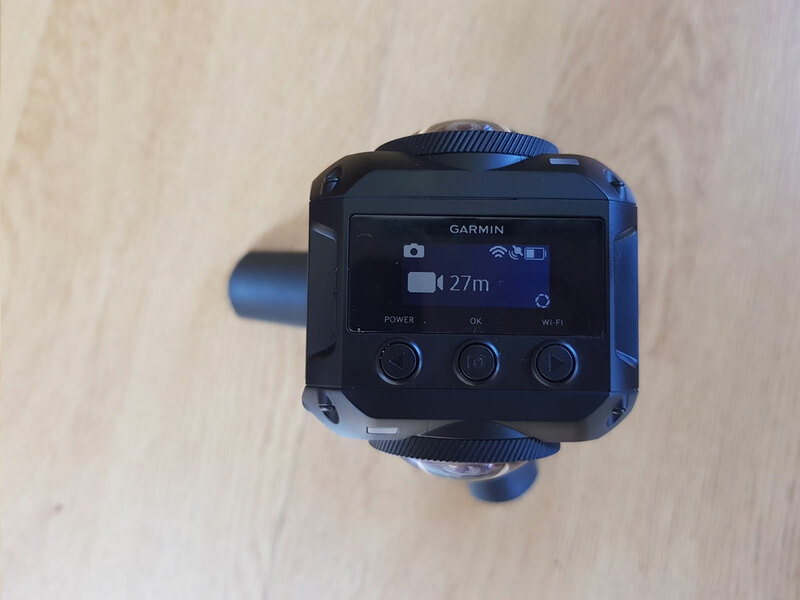 If you are looking for a 360 camera that can produce among the best video in its category with the added bonus of stabilization and augmented data overlay, then the Garmin VIRB 360 is probably the camera for you. Just remember you’ll be paying a premium price and there may a few bugs to iron out. While the VIRB 360 can shoot pretty amazing 360 video, it struggles in the photo department. Can it take decent looking 360 photos? Yes. But for the price I was expecting a little more than decent. The VIRB can shoot 15 megapixel 360 photos, which is about the same as the $200 Samsung Gear 360 2017, and way less than the Gear 360 2016 version which could shoot 30 megapixel photos. The megapixel count is important because the larger the resolution the clearer the photo will look in 360. In many ways the photos turn out rather well. The stitching is pretty on point, the colors are accurate and there is limited over-saturation. The only issue is that the resolution is simply too small to provide sufficient detailing. The VIRB 360 is definitely not a 360 camera for photographers, but it’s still going to be good enough to shoot casual photos for Facebook. The VIRB App is used to control the camera, provide an image preview and adjust manual settings. Unlike some other 360 cameras, the VIRB App can adjust many manual settings including ISO, color balance, resolution size and stitching distance. You can add stabilization and data overlays to your videos once you have filmed them straight from the app, and from their upload to various social media channels. The App has many functionalities and seems to be a good piece of software on paper, however I’ve had so much trouble maintaining a connection to the camera via the app that its left a very sour taste in my mouth. When connecting to my Galaxy S8 the app often freezes and when it does eventually connect it’s quite slow, with the connection dropping frequently. Even when the connection holds, the preview image is very low quality and lags by several seconds from reality. I’ve never experienced a 360 camera app with issues like these and it’s another sign that Garmin simply didn’t finish everything before releasing the camera. 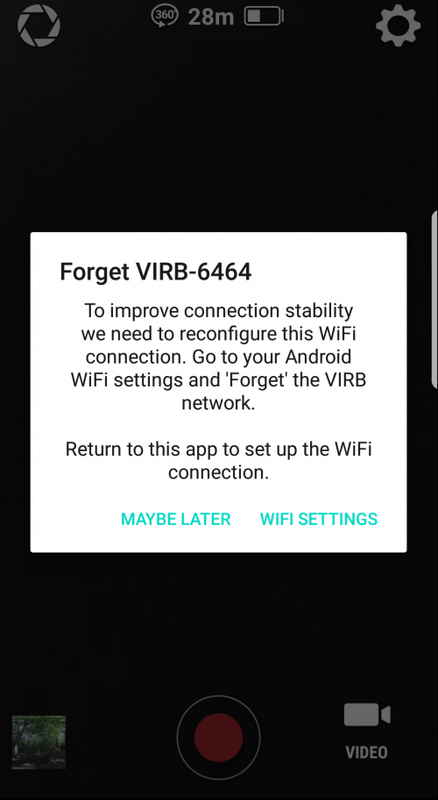 The app has already had several major updates which have improved stability, but I’m still occasionally getting error messages and disconnections. 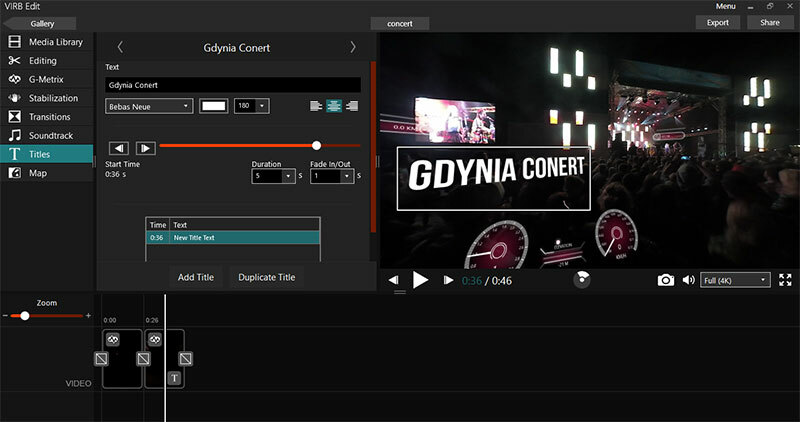 VIRB Edit is a desktop software that allows you to import and edit your videos. The software was recently updated to allow for editing of 360 video and, unlike the VIRB app, it works near perfectly. 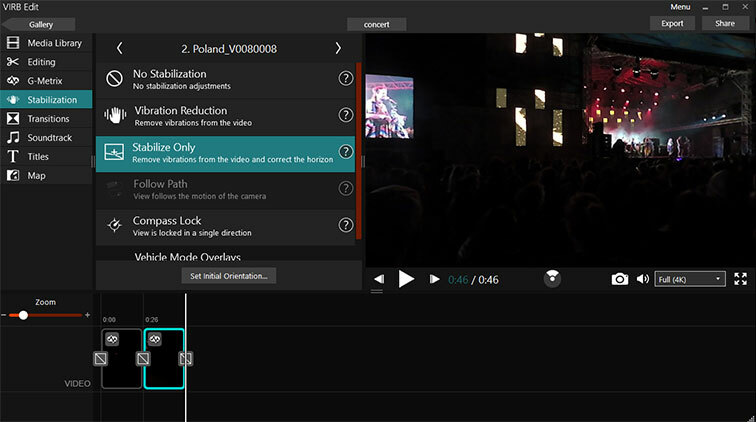 When you plug in your camera via USB, the VIRB Edit will automatically detect and import your new files; you can then create videos using the clips you’ve just imported. You can add stabilization, which works extremely effectively, text, data overlays and transitions. 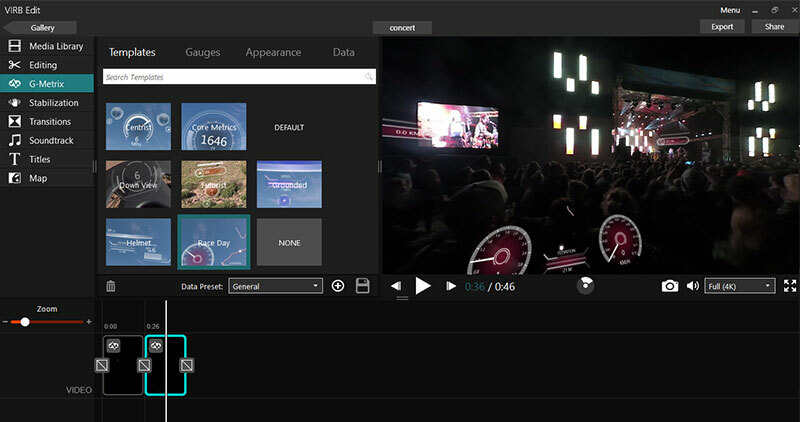 The program is very easy to use even with relatively advanced features, in fact its probably the best program for editing 360 video I’ve come across. Livestream: The VIRB 360 can livestream to Facebook and YouTube in 360, however you can only do so via on iOS app. As I have a Samsung phone I was not able to test it. Waterproof: There are not very many waterproof 360 cameras, and the ones that are require an extra case which interferes with the 360 image. The VIRB 360 is the first 360 camera to be waterproof without the need for an extra case. I was able to take my camera into the sea to test this, however I did not dare go too deep for fear of losing it the the ocean! Here is a very short video I managed to take before it cut out due to memory card issues. Still, I can categorically say that the VIBR 360 does work under water, but you better make sure the water is clear or it’s a rather useless feature (as my poor attempt at underwater photography shows). Battery: The VIRB 360 features a removable battery that can apparently last for an hour of continuous filming on one full charge. In reality I’d say this is optimistic. The batter drains very quickly when connected to the app and while filming, this may be due to the number of sensors active at once. Disabling some of the sensors may improve battery life, but you will not likely make it through one day with a single battery. At least the battery is removable, so you can always buy an extra and carry it with you. You can also purchase a powered mount which will provide power to the device while it films, useful if you want to shoot a long time lapse. It’s hard to argue that this isn’t an impressive 360 camera. 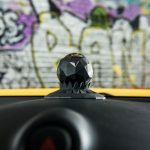 The sheer number of features and sensors is astounding, and the fact it’s waterproof and can stabilize video is completely unique among 360 cameras. It can shoot excellent quality 360 video, probably the best of any consumer 360 camera so far. It certainly has the potential to be the best, but it’s not quite there yet. The various software issues I’ve described in this review do hinder what is an excellent piece of hardware. I feel that the release may have been rushed and now Garmin are catching up with many firmware updates. The updates are fixing the issues though, and even adding new ones. Speaking of the price, there is no escaping the high cost of this action cam which is approaching the cost of a decent DSLR. For this price I expected it to just work, but it only does so with a bit of struggle. I’m confident that the bugs will be ironed out in the next few months, but you might want to check with recent users whether Garmin has done so before buying. 2018 Update: Garmin did pull through and fix most bugs, the app can sometimes crash but otherwise the software works well now. 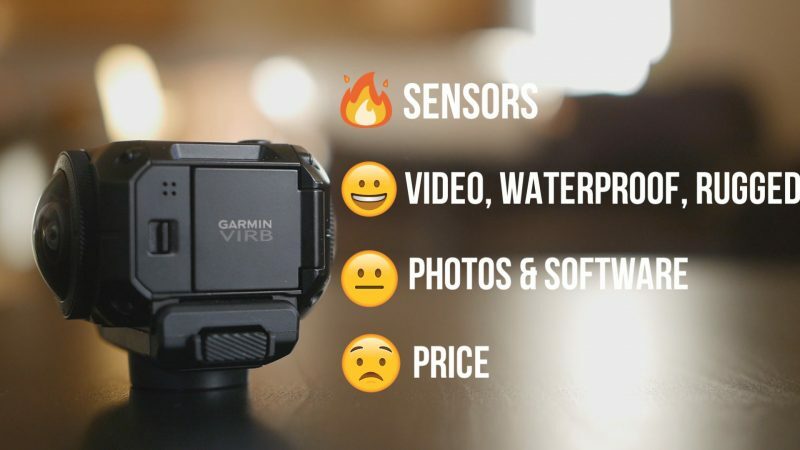 Should you buy the VIRB 360? You need to ask yourself if you are going to use all the features this camera provides. 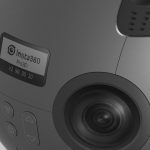 If you just want a 360 camera that can shoot excellent quality 360 video, and are not too bothered about barometers, water resistance and data overlays, then there are several 360 cameras coming that will likely satisfy you. If you want a true 360 action cam that you can take riding, sailing, kayaking, driving and anything that involves moving, then this is definitely the only 360 camera that will satisfy you. Just remember you may have to content with some software issues while Garmin fixes what it should have completed before release. I’d recommend buying the VIRB from Amazon, mostly due to their very quick delivery and good returns policy. There are also some more reviews on Amazon for you to read, most of which mirror my concerns on software but conclude that the VIRB is still a decent action camera. Using the Nikon360, I’ve found it can be picky about SD cards (speed wise), I would suggest trying a couple different kinds in it. It might just be a dodgy card. The Sandisk Ultra 64 micro cards work in the Nikon. Hi The 360 GUY : Thank You for Your nice comparison, and all your work, articles and videos about 360 Cam. I have seen all your Garmin Virb contents before I chose my 360 action cam. I am beginning editing a serie of video comarison and OUTDOOR SPORTS 360 Testing with my VIRB only. You can soon access in RidesUpBoards as more revews + contents are coming from my blog ! Cheers from south of France Mate, and keep on your awsome good work !